Comes with more-than-enough 200 ohm, 1/4-watt resistors for making connections. Contains 10 Diffused Reds, 10 Diffused Yellows and 10 Diffused Greens. 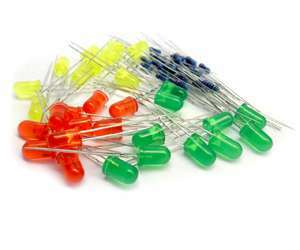 These light-emitting diodes work well for a wide variety of applications. Comes with some resistors for connection. Packaged in a resealable zip lock bag for your ease of use. Forward Voltages are Red 1.9-2.0V, Yellow & Green 2.0-2.1V. How to connect a Light Emitting Diode properly: If you are going to use a power supply like a transformer, you should use an appropriate to reduce the voltage at or below the maximum allowed level. Do not apply excess current since the brightness will only increase by a just a little bit but the LED may fail sooner. Don't forget to check the direction of the light emitting diodes before soldering them.